While grain is moving slower through the railways than might be ideal at the moment, Mark Hemmes, president of Quorum Corp., says it is nowhere near the crisis levels producers and grain companies experienced in 2013/2014. Cold weather of the past month did add a bit to the problem, but Hemmes stresses this is just the cost of doing business in one of the coldest climates in the world in Canada. “Essentially what happens with railways, if you have a mile long train, for the brake pressure you have to pump the air through a mile worth of pipe which break every 60 feet for the connection between railcars,” Hemmes explains. “The grommets that are sealing the air hoses between the cars get really hard when it get really cold and start to expel air. It becomes very difficult to pump air the way to the front and back ends of the train. But Hemmes says weather is not a major reason for the rail slowdown at CN Rail, in particular. Rather, the company is still trying to get enough personnel trained up to bring more cars and engines online. According to Hemmes, CN ramped up its hiring efforts last summer, but new recruits have to go through six months of training so were not ready in time for this year’s grain moving season. Add all the extra volume of traffic coming online from an improving economy, explains Hemmes, and you have the makings of a difficult winter shipping season. According to Quorum Corp., as of the end of January there was a backlog of 26 ships waiting in line at the Port of Vancouver for grain that had not yet arrived. Greater waiting times means increasing demurrage charges for grain companies, confirms Hemmes, which get passed on to producers. But again he stresses, while this number is high it is nowhere near the crisis levels seen in 2013/2014. Overall, Hemmes rates the rail companies’ performance as adequate in the 2017/18 shipping season thus far, especially on the southern lines, as they deal with the challenges of moving the second largest crop by volume (83.5 million metric tonnes) in recorded history. “We’re hoping CP can continue to perform well, and we are looking forward to when CN starts getting some of these resources in position so the volume in traffic can start to ramp up on the northern lines,” he says. With the economy heating up, the railways are having some difficulties keeping up with grain transportation this winter. But the picture is not wholly negative, according to one grain transport industry expert. 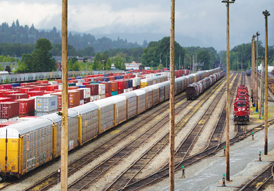 CN and CP Rail are dealing with the challenges of moving the second largest crop in Canadian history, increased demand for cargo transport from other industries.